Band for Cut and Sew Neckline. The club has been in existence continuously for at least thirty years. It started to meet in Esher, Surrey and then moved to Fetcham, was for many years in Effingham, and is currently in Great Bookham, Surrey. Its aim is to further the craft of Machine Knitting in any way possible. Our meetings cover a wide range of allied craft subjects, and many members are also excellent hand-knitters and interested in dressmaking and sewing etc. Meetings are on the 2nd Wednesday of each month at 8pm and normally last to around 10:30pm with a refreshment break. Except for August when we have a fun meeting – lunch or a trip – we are at the hall in Bookham. In December we normally have a Christmas Party instead of the usual meeting. You can attend you first meeting completely free but after that, there is a charge of £4 per meeting. This covers our costs as well as the coffee or tea and cake. From January 2013 meetings we are meeting at the Old Barn Hall, Church Road, Bookham, Surrey, KT23 3PQ England. Meetings are in the Harrison Room which has its own entrance towards the rear of the building on the right hand side as you face the building. Parking is also at the back of the car park on the right. Committee members have the code to enter via that door and will try to be at the hall well before the meetings start. The 2018/2019 programme, please look in the Programme menu item. Try this if you want to arrange a meeting or even for a group. UK organisation dedicated to keeping the craft of Machine knitting alive. Anyone can join who is interested. New and used machines, spares, repairs, yarn, classes, patterns. Doug also has used Hague Linkers and thousands of useful bits and bobs as well. The place is an alladin's cave for machine knitters. Note opening times - not every day. In addition to machine knitting classes given by Brenda, she also does lace making. A long established wool shop in Carshalton Beeches, between Banstead and Carshalton. Based In Austin Texas, Diana Sullivan has a large range of tutorials and YouTube videos as well as patterns both free and paid for, DVD's for sale etc. This is her blog which gives links to all her items. A well known US machine knitter who has some online Craftsy Classes as well as some excellent books, including those for those people who have simple or the plastic mid-gauge machines which have no patterning facility. An online learning platform for all creative people. These mainly paid-for courses cover a range of topics including machine knitting. A very professional platform with the opportunity to take part in courses by asking questions of the tutor and posting your projects and photos. A video platform where there is such a huge range of videos both amateur and professional that it defies description. For machine knitters, search for machine knitting in the box at the top to get a list of items. You can subscribe to people you like to see more of their things and get notifications if you want to when they post a new item. Note to newbies, please be careful - not everything is benign. Online sales of machines, spares, accessories, books and yarn. Good service. The Guild Website Calendar page giving events that the guild is attending. Free pattern books, magazines and manuals. Most makes and models. All downloadable as PDF files. Highly recommended for all those lost manuals. After last year's success, this year we got a Highly Commended. 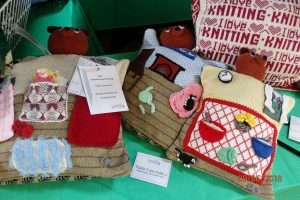 There were many more entries and only one highly commended so we were quite pleased.